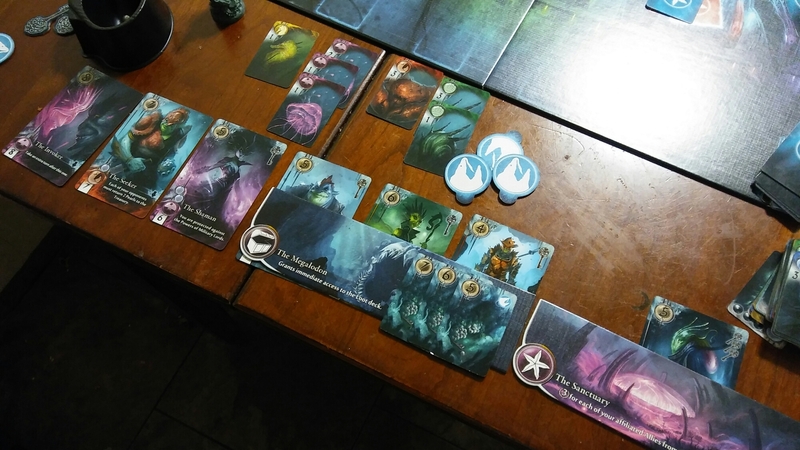 On the 7th day of gaming my true love gave to me…..
Abyss is a quick, smooth playing game designed by Bruno Cathala and Charles Chevallier and published from Asmodee. The goal of the game is to get the most Prestige points to be the new leader of the Ocean Folk. Along the way you gain favor from some of the faction’s Lords in the form of in-game benefits or end game scoring. These Lords give you the best chance at winning the game. If you get enough Lords that have keys on them, they grant you access to certain Areas that give you even more bonuses. In this particular game, I was able to get 7 Lords, which is the end trigger for Abyss, which also allowed me to win. If you have not had a chance to play Abyss, I strongly urge you to do so. The game is smooth, with quick thinking choices that have just the right amount of player interaction. There is one faction that can screw with other players but most of the time it is for a limited time and doesn’t do that much damage. It even gets better with the addition of The Kraken expansion.